Under Seat Storage SystemLaser measured and custom fit to the exact make and model. WeatherTech Under Seat Storage System is a custom-fit pickup truck storage bin that fits underneath your rear seat to keep all of your essentials organized. The Under Seat Storage System is the easiest to install, custom-fit solution for storing and organizing your cargo in your truck. Protect your investment against stained and torn carpet by perfectly lining the rear truck floor. The liner’s "soft touch" material and built in dividers help to prevent cargo from shifting, and provides easy loading and unloading of your essentials. Made from a 100% recyclable and odorless thermoplastic elastomer; Under Seat Storage System is durable and chemical resistant. Custom-fit for each application, Under Seat Storage System securely fits the exact contours of each vehicle, and will not crack, break or warp in even the most extreme temperatures. Installation takes only minutes without the need for drilling or use of chemical applications. Under Seat Storage System is secured to your truck with a simple buckle and strap that allows for an effortless installation and the ability to easily remove the storage system if necessary. Easiest to install truck storage - PERIOD! No tools, drilling or hazardous chemicals required for installation. "Soft touch" 100% recyclable, chemical resistant, and odorless material. Will not break down, crack, break or warp. 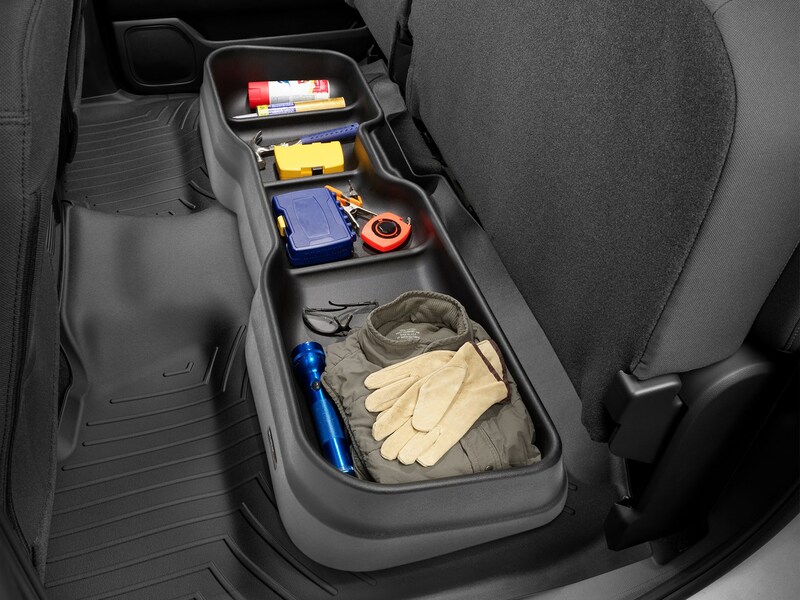 Built in dividers help keep your cargo organized. Can I install Under Seat Storage System on top of my FloorLiner? Absolutely! Under Seat Storage System is designed to fit perfectly with a WeatherTech FloorLiner installed. Can I install Under Seat Storage System without a FloorLiner? Yes! Under Seat Storage System will fit without a FloorLiner. How thick is the material used to make Under Seat Storage System? The material used to make Under Seat Storage System measures 3/16" thick. Does Under Seat Storage System have dividers? Yes, the Under Seat Storage System has built in dividers when applicable.